My name is Jack. I am a professional carpenter with 30 years’ experience. I grew up in a woodworking family. My father and his brothers owned and operated a commercial carpentry shop. I have encountered many tools in my 3 decades career but the one which stands out is the router bits set. This tool has become an indispensable part of the modern craftsmen’s arsenal and having the best router bits set is vital in your workshop. Beginners, do you need an expensive router bit set? 3. CMT 800.505.11 13-Piece Router Bit Set, 1/2-Inch Shank. 4. Whiteside 401 Basic Router Bit Set, 1/2-Inch Shank, 7 Pieces. 5. Neiko 10115A Premium Tungsten Carbide Router Bits | 80-Piece Set | Aluminum Storage Case. 6. MLCS 8377 15-Piece Router Bit Set with Carbide-Tipped 1/2-Inch Shanks. 7. Yonico 17702 70 Bits Professional Quality Router Bit Set Carbide. A router or a router table is only as good as the router bit which is the business end of this tool. To those new to woodwork router bits are the part that is in contact with the wood. Router bits come in two distinct variations. These are edge forming bits and the non-edge bits. Edge forming bits have a bearing. This functions as a fence when routing. Whereas the non-edge bits need one to use a fence either attached to the work, table or router. When choosing router bits there are three dimensions that matter. These include collet size, shank length and shank size. In terms, Collet size can be either 1/2inch or 1/4inch. Through experience, I recommend the 1/2 inch. They are stiffer, bigger, and stronger. Also, they are better to resist vibration, flexing and bending. Joe also would advise you to consider bits with the shortest size to do the work. With the bit type and size established. Another very important aspect to consider is the material. On the market, they come in either High-Speed Steel (HSS) or carbide. I recommend carbide bits. Carbide is carbon and metal powders fused together to form a very strong element. Carbide bits can hold a cutting edge for 15 to 20 times longer than HSS. The fine edges of high-quality bits are sharp and thick enough that they are capable of multiple uses. Also if you need to work on synthetic materials like MDF or Plastic carbide bits are better. They have a longer lifespan provided they are stored well. Storage is so crucial that you should buy a set with a good case. The disadvantages of carbide are the high cost. Carbide comes in four forms from C1(monograde) to C4. Monograde is the highest quality and tends to be costly. Some manufacturers can also temper with the ratio of carbide to steel. This results in a router bit with very little carbide and cheaper steal. Whereas HSS is affordable it can usually cost half the price of carbide. The other advantage is that the bits can be easily sharpened if blunt. Yet, they tend to go blunt quick. Now that we have given you a brief background on router bits. It is worth noting that a workshop needs a set of router bits. You might have realized that router bit sets come in many sizes from 5 bits, 10, 15 and upwards of 70-80 router bits. This often becomes very confusing to beginners. Experience has shown me five router bits used the most in a workshop. The essential five types of router bits are Straight bits, Round over bits, Ogee bits, Rabbeting bits and Chamfer bits. Straight bits is in the class of a field or surface cutting bit. This is because it has side and bottom cutting edge for cutting into the work surfaces and then be moved horizontally. The bits have straight or spiral flutes. The straight bit is used to make either functional or decorative cuts. The cuts include rabbeting, tenons, mortises, inlays, dadoes, box joints and spine joints. Straight bits are more important bits if you already have a router table. Whereas Round-over bit is an Edging-forming bit. This class of bits is for cutting decorative profiles along the edge of the workpiece or cut one or both parts of an interlocking joint. The uses include tables, shelves, and stair treads. Ogee-bit is also an Edge-forming bit. Its uses include decorative edges on furniture, shelving and moulding. Rabbeting-bit is another an Edge-forming bit used for cutting rabbets and lap joints. Rabbeting bits are useful if you need to work on a number of identical rabbets. Rabbeting bits can be used in a router table or a handheld router. If you need to make a picture frame, rabbeting bits are what you need. The fifth essential bit is the Chamfer-bit this is also an Edge forming bit. It is used for making bevelled edges on boards and laminates. Tip: Raising the bit can increase the depth of the chamfer. With these five I promise you that you can do most of the work needed in the workshop. Buying a set with more specialized bits is still good if you want to be more creative. Your routers could have ¼ inch or ½ inch collets, some routers can have both. With an adapter, a router that has ½” collet can work with both ½” shanks and ¼” shanks while a ¼” collet can only accept ¼” shanks. Most professional woodworkers like ½ “ shank bits because a ½ “ shank bit is able to give you stronger and steadier cuts, especially in heavy or deep cuts compared to a ¼” shank. ½” shanks are also more durable, better at resisting breaking and vibration. Note: when choosing shank length, get the one that has the shortest shank. As a professional woodworker, I like to buy high-quality bits. I already know what I needed in mind and what I am going to do with it. But what about beginners? Everybody has to start somewhere, should you buy an inexpensive router bit set? Now, a reasonable price(not cheap, do not buy cheap) router bit set that comes with a good variety of bits can be a good starting kit. They are not going to be your life-long best friend as they are not the highest quality bits, but they can offer you good learning experiences by having choices to pick what you do use and what you need, not just what you want. After getting used to your starting kit, depending on your projects and your experiences, you might need to purchase different types of router bits later, which you already know what you want(and what you need) by then. You also don’t want to ruin your expensive bits when you just starting out due to lack of experience. A small note: a more specialized bit often costs more, so think again if you have a moment of getting something “fancy”. My advice: if you are on a budget, only buy an expensive bit if you are going to use it daily, otherwise Yonico and MLCS bits are good for the money. However, a higher quality bit give you better results, durability, save you hours of headaches and is much safer as they could have anti-kickback designs, which provide an extra margin of safety. You’ll be surprised at how smooth a Freud router bit can cut compare to other bits. If you already know what you want for your project, go with the highest quality bits and you’ll be sleeping better at nights. Now that we have given you enough background knowledge on the subject of router bits. The second part of my article is a guide and product reviews of 8 router bit sets. These are some of the best router bit sets I have encountered and are popular on the market these days, stay with me to discover who makes the best router bits in 2019. 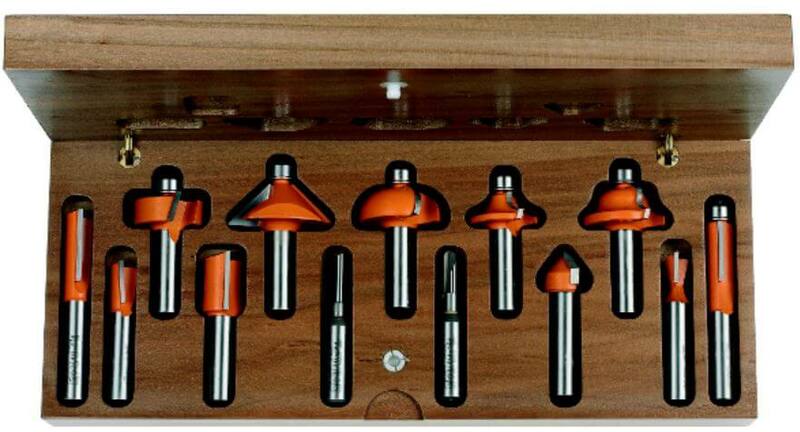 The best router bits set on the market is undoubtedly the Freud 91-100 13-Piece Super Router Bit Set. Save your time and buy this one if you are in a hurry, otherwise please keep reading cause you will like it even more. Old Jack personally uses this in his warehouse and I just love it for the smoothness feeling when cutting. This range from Freud is made from TiCo high-density carbide. Freud’s permaSheild coating resists dulling from intense heat. More so it has minimal pitch buildup. The computer-balanced bits offer vibration and chatter-free operation. This comes in handy when operating at high speeds, making the work smooth. And each of the router bits come with a high shear angle to produce fewer tear outs and minimal chatter marks. These premium bits have high shear angles for fewer tear-outs and minimal chatter mark. All bits have 1/2″ Shank. Includes attractive wooden storage box. It has enough bits to handle composition materials, plywood, hardwood, softwood and MDF. Joe uses them on hand-held and table-mounted portable routers. Another encouraging thing is that they come with a limited lifetime warranty. This is a testament to the manufacture’s faith in this product. Even though I own this set, I have to point out a few grey areas. The biggest letdown is the storage case which is not durable. Many other users are also complaining about this issue. I ended up making my own custom case to store the bits. Remember as I mentioned earlier carbide bits need good and careful storage to last. Another grey area is that the set does not come with extra bearings. It has high-quality Micrograin carbide tips that are precision ground. This provides superior wear resistance and sharp edges for the best finish. The other thing I like is that it has both types of shanks a 1/2 inch.-shank bits give greater stability and LEDs. The 1/2 inch also has reduced vibration during use. Whereas 1/4 inch shank bits are more ideal for the thin profiles. This Bosch set is well engineered the biggest let down is that I wish it could come with more bits. This is my next buy if ever I need to replace my set. This bit set comes with a hardwood case which is the best case on the market. So you sure that you can store them well. The bits have 2 SinterHip Hi-Density Industrial Chrome Carbide cutting edges. These features are for long-lasting performance. Some bits features anti-kickback design for working in a safe way. CMT is a great brand and it is a high end set for those who established in the craft. It is not ideal for novices that is why it’s not number 1 and the price is hefty. This set has carbide bits for long-lasting service. Secondly, they have precision grinding which ensures excellent balance at high speed. The set comes with a small and durable case for convenient storage. The bits also have a ½ inch shank for vibration free operation. The manufacturer did not label the bits with graphics of the cuts. More so they do not label the bit with dimensions. I saw this set last week at a yard sale and was able to get on my hands on it. The reason it ranks so high is because of its affordable and great value for money. It’s good for entry-level, however, it is both entry-level woodworkers and pros favourite choice because it comes with 80 bits. The impressive quantity will give you a lot of nuanced control over your cuts and styles. The set has Precision Ground 1/2″ Shanks. The bits can withstand high-heat and Speeds up to 20, 000 RPM. Storage wise the aluminium carrying case is handy. Another thing I liked is the special dark blue colour with gold powder coating. The downside is the low-grade carbide used. I would recommend replacing individual bits with stronger bits as they wear out. I also noticed that the storage box was low quality as well. Yet, for the price, it is a very decent set. One of the best-valued router bit set. I saw this advertised in a catalogue and I did research on them due to the surprisingly low price. 1 bearing to convert the round-over bit to a beading bit. For an all-purpose starter set for your woodworking hobby with $44, you get a decent set with 15 bits. Quality, carbide-tipped bits, wood storage box Included. The package also includes an Allen wrench. The blades do not last sharp for long. Another grey area is that the bits are not durable you will have to replace them one by one as time goes. The set has only one bearing size. The best-valued router bit set, retailing on Amazon at a good price for 70 bits. This is a good professional set with many bits to choose from. I encountered this set while giving tutorials to a certain guy. Having 70 bits with different styles opens up a world of more creativity. The bits are made from micro-grain carbide tips. During use, there are very low vibrations due to precession balancing. Moreover, the fully enclosed bearings provide smooth operation during use. I like that the carbide is thick, well sharpened and the finish is good on Yonico bits. I noticed that the quality of the bits is well-made but not superb. Many users have complained about blunt and chipped bits from the factory. Another complaint has been of the bearings burning out. I guess the manufacturers emphasized quantity over quality on this set. It could be an old problem as it seemed that Yonico has improved the quality of their bits quite significantly. Point Note: For the US market this set uses Metric units so have that in mind when purchasing them. When buying a product, we often care about brands. I often tell my students not to go with cheap bits, you get what you pay for. You could end up looking to buy new bits soon to replace bits that are dulled prematurely, broke or chipped. So don’t cheap out on router bits as good quality bits are not only better in term of durability but also safer as they can also minimize the risk of kickback due to their special designs. Good brands give you a better quality router bit set while they also offer good customer services. I talked to some friends and we agreed that the top brands are Freud, Whiteside, Bosch. They are known to be trusted in woodworking communities for their quality and also for their superb supports/warranties. Although Yonico and MCLS gave the impression that they are on the cheaper side, their products are well-made. I especially like their customer service when my guy told me they had sent him a replacement for his bits with no questions asked. Honourable mention to Infinity, Amana, Eagle America as well, they are also well-known names in our community. In conclusion, for beginners, I recommend buying a set with many bits. This gives you a chance to explore many designs. So, for entry-level woodworkers, I recommend MLCS 8377, the most affordable set with many bits for a very good price, it’s actually the best router bits for the money. For professionals, I recommend the top 3 the Freud 91-100 13 bit set, the Bosch RBS010 or the CMT 800. Another parting word is that make sure you use a router with adjustable speed. This will increase the lifespan of the bits. I hope this router bit set reviews guide will help you in your quest to buy a router bit set. See you next time and enjoy the craft. Old Jack has received some emails saying that I’ve got the numbers wrong for our product list. Please excuse me for old age, give a minute to make sure I got it right this time. Some of you asked me to write a guide on how to take care of your router bits. Here it is, how to sharpen your router bits and How to clean router bits and maximize router bit life. Consider reading this small guide to knowhow to use your router bits, I hope it’ll be helpful to you. Be safe, stay tuned and enjoy the new year 2019 with your family. Router lift and plunge router are important tools when working with a router table and a wood router. Check out this guide to buy the best router lift and best plunge router in the market. Find the top raised panel router bits here. Top rail and stile router bit here. More details of Yonico router bit review in this guide.